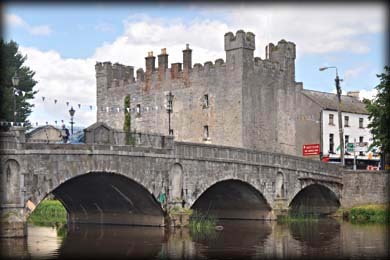 White Castle was built in 1417 by Sir John Talbot the Viceroy of Ireland to protect the newly built bridge over the River Barrow. 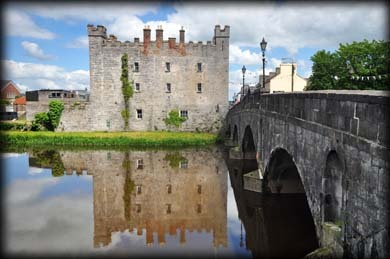 Originally the southern half of the castle, nearest to the bridge, was a four storied rectangular urban tower house. Modern rendering obscures a lot of the original features but you can still see some of the punch-dressed stones around the windows. There is a crucifixion plaque on the left side of the original doorway bearing the date 1573 and the name Richard Coosen, Sovereign of Athy. On the right of the doorway is the Earl of Kildare's coat of arms, signifying the Earl's ownership of the castle in the past. 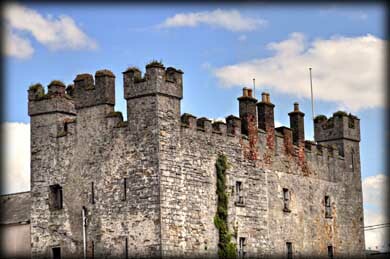 In 1802 a three storey rectangular extension was added to the north side of the castle and the battlements were added. All this was done after the 1798 rebellion to facilitate it's use as a prison. A further smaller extension was added to the north end in 1830 when the building was used as the RIC (Royal Irish Constabulary) police barracks. Sash windows were inserted in 1872. The building was again renovated in the 19th century, when it was used as a private residence. The castle was owned by the Doyle/Norman family for over a hundred years before it was sold in 2005 for 1.3 million euros. It was recently sold in 2012 for as little as 195,000 euros. 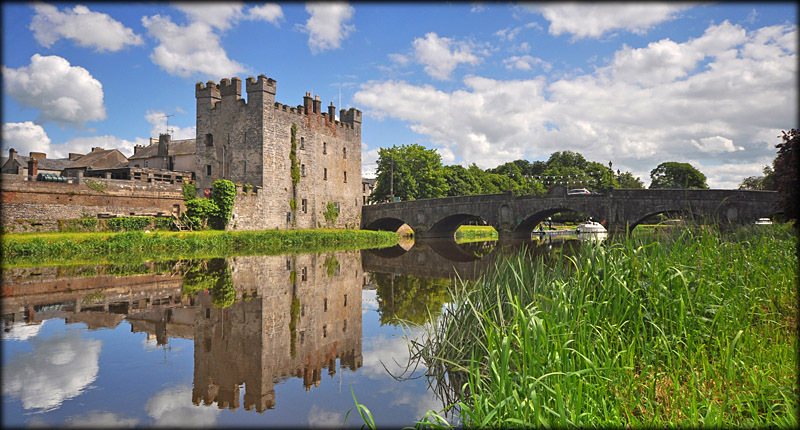 There are some splendid views of the castle along the banks of the River Barrow. Situated: Very easy. Located in the centre of town on the east bank of the Barrow River to the north side of the Cromaboo Bridge. Discovery Map 55: S 6818 9397. Last visit June 2014.